Ayman al-Zawahiri as seen in a photo obtained March 3 when an earlier audio speech by him was posted on jidhadist forums. (CNN) -- A jihadist website on Saturday posted an audio message purportedly from key al Qaeda figure Ayman al-Zawahiri. The message, according to the website, was recorded "prior to the martyrdom of Sheikh Osama bin Laden." The speaker talks about "winds of changes" that have occurred in Tunisia, Egypt and Libya. He also mentions Yemen. 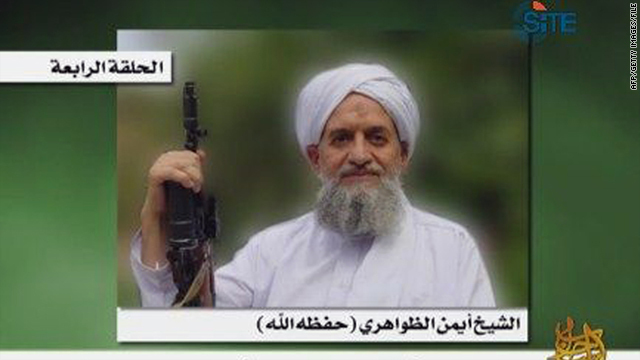 Al-Zawahiri, who was second in command under bin Laden, calls the United States leader of "crusader enemies." "NATO is not a goodwill organization -- it is an aid to the hegemonic powers in this world," al-Zawahiri allegedly says in a portion of the tape on Libya. "They aim to end the corrupt (Moammar) Gadhafi regime but then install their own ideals. They want to steal Libya's resources and relics because of their greed and politics." He advised Egyptians to help Libyans in their fight. "The fight in Libya today is the fight of the Muslim nation after the governments failed to protect the Libyan people from the crimes of Gadhafi." The message also congratulated Egypt for ousting President Hosni Mubarak. CNN could not confirm its authenticity. Al-Zawahiri, an Egyptian, was considered to be bin Laden's presumed successor, but that may not be the case. Saif al-Adel, a former Egyptian special forces officer, has been chosen as interim leader, according to CNN contributor Peter Bergen. Radical Islamic websites on Wednesday posted a similar Arab Spring audio message purportedly recorded by bin Laden shortly before he was killed by U.S. commandos in Pakistan May 2. The recording, which is more than 12 minutes long and was released by al Qaeda's media arm, As-Sahab, lists the speaker as bin Laden and calls him "the martyr of Islam." The audio begins with a prayer and remarks reportedly made by bin Laden about anti-government protests and uprisings earlier this year in several African and Middle East countries. CNN, which translated the audio, could not confirm its authenticity, either.